Packaged food stocks have had a tough time over the past year. Companies whose products occupy the middle aisles of the local grocery store are under pressure. Consumers have steadily moved away from packaged, shelf-stable foods, in favor of fresher foods like organics. This requires investors to be more selective when it comes to picking food stocks. Investors should consider stocks with an international focus. Mondelez International (MDLZ) is a high-quality food stock with plenty of room for growth up ahead. It has a dominant position across the developing world, where economic growth is higher and consumer appetites are still strong for packaged foods. 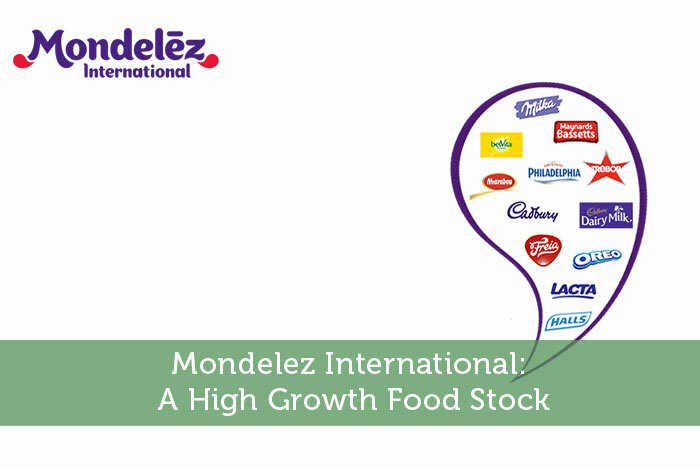 Because of its exposure to high-growth emerging markets and its high rate of dividend increases, Mondelez is one of the top food stocks for dividend growth investors. Mondelez was formed in 1989 as a result of the merger between Philip Morris and General Foods Corp. In its current form, Mondelez International is the result of Kraft Heinz splitting up its North American grocery business and the international foods business. Today, Mondelez is a global food giant, with annual revenue of $26 billion and a stock market capitalization of $72 billion. Unlike many of its U.S.-focused peers in the food industry, Mondelez continues to report strong growth. Organic revenue was up 2.5% last quarter, on strength in emerging markets as well as higher volume/mix and pricing. Adjusted earnings-per-share increased 21% in the fourth quarter as operating margin expansion was accompanied by higher equity investment income, and share repurchases. Mondelez repurchased $2 billion of its own stock in 2018. Mondelez performed very well last year, and 2019 is shaping up to be another very good year. Mondelez expects 2%-3% organic revenue growth for the full year. Management guided for 3% to 5% adjusted EPS growth for 2019. Looking out further, Mondelez expects long-term organic revenue growth of at least 3% per year, along with EPS growth in the high-single digits. Mondelez possesses many competitive advantages that fuel its continued growth. First is its exposure to the emerging markets, such as China and India. Emerging markets broadly have large populations and high rates of economic growth, making them very attractive growth targets for global food manufacturers like Mondelez. Mondelez generates 75% of its total revenue from outside the U.S., and 37% of its annual sales come from the emerging markets. This has provided the company with a meaningful tailwind. In 2018, Mondelez generated 5.7% organic sales growth from its emerging markets, which was significantly higher growth than in the U.S. last year. This included double-digit organic revenue growth in India last year, for the Cadbury brand. Separately, the Oreo brand remains the #1 cookie around the world, particularly in high-growth markets. Mondelez generated over 10% organic sales growth in China for the Oreo brand last year. The other main competitive advantage for Mondelez is its focus on snack foods. While certain segments of the packaged foods industry are really struggling right now—such as prepared meals and canned foods—snacking remains a growth category. Mondelez has a large portfolio of snacks brands, such as Oreo, Cadbury, Ritz, Triscuit, and many more. 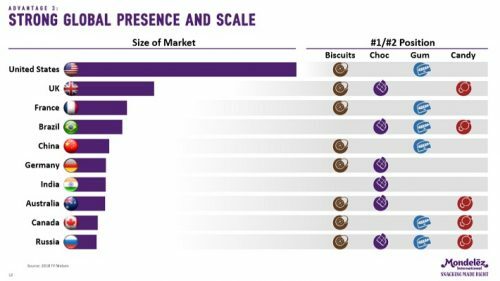 In its core categories, Mondelez holds the #1 market share position in biscuits, candy, and chocolate. Indeed, Mondelez has generated strong growth in the years since it was spun off from its former parent company. Since 2013, the company grew its adjusted EPS by 18% per year. Mondelez has already staked its claim in multiple growth markets, with the potential for rapid growth in the years ahead. This will allow the company to continue raising its dividend at high rates each year. Income investors are widely drawn to the food industry, in large part because of their dividend payouts. Mondelez does not have the highest dividend yield of the major food stocks, but it does offer a mix of a solid yield along with strong dividend growth. Mondelez stock has a current dividend yield of 2.1%. This is lower than many industry peers, but still beats the average dividend yield of the S&P 500 Index, currently at 2%. And, Mondelez makes up for a relatively low yield, by raising its dividend at high rates. The company raised its dividend by 17% last year, after a 14% hike in 2017 and a 12.5% raise in 2016. Investors can be reasonably confident that as long as Mondelez continues to execute on its strategic priorities, that high dividend growth is likely. Mondelez management expects to raise the dividend at a slightly higher rate than its adjusted EPS growth over the long-term. EPS growth will be driven by sales growth, margin expansion, and importantly share repurchases. In addition to its dividend payments, Mondelez returns cash to shareholders through stock buybacks. The company spent at least $2 billion each year repurchasing its own stock since 2015. Mondelez expects to utilize another ~$2 billion for stock buybacks in 2019. Repurchasing its own shares helps Mondelez grow EPS, as fewer shares outstanding allows each remaining share to receive a higher portion of earnings. Mondelez has a high-quality business model, with a large portfolio of category-leading brands. The company generates strong free cash flow which it uses to invest in growth and return cash to shareholders. These qualities make Mondelez an attractive stock for long-term dividend growth investors.